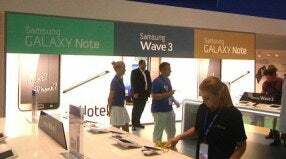 Now you see it, now you don't: Samsung Electronics erased all traces of the Galaxy Tab 7.7 from its exhibition stand at the Internationale Funkausstellung (IFA) in Berlin on Saturday, just two days after launching the tablet there. Until Sunday the left most sign advertised the Samsung Galaxy Tab 7.7. It was replaced after the Galaxy Tab 7.7 disappeared from the company's booth at the IFA consumer electronics show in Berlin. On opening day, a large backlit panel by the stand's entrance named three products: the Wave phone, the Tab tablet and, in the middle, the Note, which is between the two in size. By Sunday, an opaque board promoting the Wave had been stuck over the sign for the Tab, and staff on the stand refused to discuss the device or the changes. "That's confidential," said one. Samsung's European PR director, Brendon Gore, was a little more forthcoming about the Galaxy Tab 7.7's fate. "We took it away yesterday. It's not here," he said Sunday. "When we get an official communication from the Dusseldorf court, we can comment. That's all I can say." Dusseldorf is where Apple is suing Samsung to stop sales of the 7.7's big brother, the Galaxy Tab 10.1. European intellectual property laws allow companies to protect to the appearance of their products, in addition to the copyright, patent and trademark rights recognized in other jurisdictions. Apple claims the appearance of the larger Galaxy Tab is too similar to that of its iPad 2, the design of which is registered with the European Union's Office for Harmonization in the Internal Market. A sign previously advertising the Samsung Galaxy Tab 7.7 was replaced with an image of the Galaxy Note, after the tablet vanished from the booth. On August 25, the Dusseldorf court upheld a preliminary injunction ordering Samsung Electronics to stop selling the Galaxy Tab 10.1 in Germany. The injunction had initially banned imports of the tablet across the E.U., but the court later reduced its scope to cover only Germany. A final ruling in the case is expected on September 9. Samsung's lawyers must at least have anticipated the possibility that the court's ruling would apply to the smaller tablet too: The Galaxy Tab 7.7 demonstrated by Samsung staff following its launch on Thursday bore a prominent warning sticker: "Not for sale in Germany." Dusseldorf is not the only place Apple and Samsung are fighting one another in the courts. On August 24 a Dutch court banned imports of three Samsung smartphones after finding that they breached an Apple patent, while in Australia Samsung has postponed the launch of the Galaxy Tab 10.1 pending the outcome of a lawsuit Apple filed with the Federal Court of Australia. With additional reporting by Nick Barber of IDG News Service and Daniel Behrens of PC Welt.